Leading US-based hosting service provider focuses on reliability, scalability and security for SMB and enterprise solutions. Our new elastic scalable cloud, powered by Jelastic, provides new levels of simplicity, scalability and reliability. Jelastic, Inc., the first company to deliver Platform-as-Infrastructure, today announced that Webhosting.net has chosen Jelastic for its new advanced cloud hosting platform. Webhosting.net customers can access a free, two week trial of Jelastic’s Platform-as-Infrastructure solution starting today. Jelastic’s Platform-as-Infrastructure software provides hosting service providers with a rapid path to new and recurring revenue by offering a turnkey cloud solution that delivers PaaS and IaaS in one. Service providers install Jelastic on bare metal servers and can quickly add new customers looking to deploy and manage applications in the cloud. "Our customers have always relied on Webhosting.net to provide enterprise-class hosting solutions and world-class customer service," said Anton Resnick, CEO, Webhosting.net. "Our new elastic scalable cloud offering, powered by Jelastic, provides new levels of simplicity, scalability and reliability for customers deploying applications to the cloud." Jelastic enables enterprise architects and developers to deploy new or legacy applications to the cloud without any code changes, providing them with a scalable, highly available and secure environment in seconds. Developers can rapidly set up application and database environments and ensure application resource availability with Jelastic’s automatic vertical and horizontal scaling features. Truly elastic scaling and an innovative pricing model means that enterprises pay only for resources used, increasing efficiency and driving down costs. 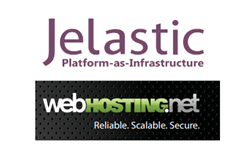 "Webhosting.net is recognized as a leading service provider for businesses of all sizes and we are thrilled to partner with them," said John Derrick, Jelastic CEO. "As more enterprises look to deploy new and existing applications to the cloud, it’s critical that they find a solution that enables rapid deployment, simple management and fully automatic scaling. Jelastic’s Platform-as-Infrastructure software and Webhosting.net’s infrastructure, service and support provide customers with a truly elastic, enterprise-class cloud." Since 1998 WebHosting.net has provided reliable, scalable and secure web hosting solutions for individuals and businesses of all sizes. WebHosting.net prides themselves on solid network reliability and continuous customer service, delivering services through a carrier-class colocation facility that ensures efficient delivery of low-cost hosted services. For more information, or to start a free, two-week trial of Jelastic, visit http://www.webhosting.net. Follow us on Twitter @Webhosting_net. Jelastic, Inc., provides enterprise software that re-defines the economics of cloud deployment and management. Jelastic is the first company to deliver Platform-as-Infrastructure, combining the flexibility of IaaS and the ease of use of PaaS within a single turnkey platform, at a fraction of the cost of existing virtualized environments. Jelastic, headquartered in San Mateo, California, enables enterprises and hosting service providers to unleash the full potential of the cloud. For more information or to start a free, two-week trial, visit us at http://www.jelastic.com.